After a year at my new job the benefit enrollment season just opened again, and I made one change to by benefits that I hadn’t ever done before – I signed up for a Flexible Spending Account (FSA). For those of you that don’t know, a Flexible Spending Account allows an employee to set aside pre-tax dollars to pay for “qualified” expenses that usually include health care and/or dependent care. I know what you’re asking… Isn’t that why you sign up for health insurance? A FSA goes above and beyond your typical health care plan by helping you pay for everything your insurance company doesn’t. All those $10 co-pays, deductibles, and prescription drugs can be paid for using pre-tax dollars. Many plans also allow you to pay for vision, dental, and even over-the-counter medication using your FSA! The plan typically works by allowing you to elect a certain amount to be deducted from your paycheck, before taxes, each month (up to $5,000 per year). As you spend money on plan-covered items, you simply submit a claim for a refund which is paid from your pre-funded plan balance. In recent years, many plans have included a FSA debit card which allows you to directly pay for your medical expenses from your plan balance, without the hassle of submitting refund claims. But a Flexible Spending Account is not without it’s dangers. One major drawback is that the money must be spent within the coverage period. This coverage period is usually defined as the period that you are covered under the cafeteria plan during the “plan year”. Any money that is left unspent at the end of the coverage period is forfeited back to the company; this is commonly known as the “use it or lose it” rule. However, most plans now allow you to spend any remaining money at the end of the year on non-prescription drugs or medical supplies. So just run to Costco and stock up on Tylenol and Band-Aids! But the main advantage of a FSA is the tax savings. An FSA allows money to be deducted from an employee’s paycheck pre-tax and then spent on qualified expenses. For an example of potential tax savings associated with a flexible spending account, a person in the 28% Federal marginal tax bracket and an example 4% state tax (along with FICA taxes of typically 7.65%, for a total tax of almost 40%), could deduct $2,000 and put that money into an FSA for health care. This would result in almost $800 in tax savings. 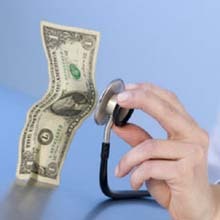 There’s a great little FSA benefits calculator at http://www.ebsbenefits.com/members/fsa_calc.htm#taxsav that will allow help you to estimate your yearly medical expenses, and calculate the potential tax savings from enrolling in an FSA. So the moral of the story is… if your employer offers a FSA, I would highly recommend enrolling. If your employer doesn’t, then request that they do. Similar to my thoughts on enrolling in your employer’s 401(k) plan, there’s no reason you should be passing up this “free money.” You pay for medical expenses each year, so why not save money while doing it? The big problem with F.S.A. is that the money set aside needs to be used in the calendar year or you lose it. That is the biggest government scam. How are you supposed to forecast when you get sick and when you are going to need the money…?? Isn’t it ludicrous that our legislators set up such a scam ? Fot the FSA to make any sense, money set aside for medical expenses should sit in the account till is needed not just stolen if not used. For the FSA to make any sense, money set aside for medical expenses should sit in the account till is needed not just stolen if not used. Another BIG disadvantage to FSA’a is that if you lose your job, you immediately lose all the money that you contributed to your FSA even if you have other expenses beyond that, you can not access that money. Get rid of FSA and go to HSA instead. HSA will roll-over year to year and can be moved without as many problems. Jason clearly is writing theoretically and has no pratical experience of an FSA. The reality is that they are awful things, benefiting only the company when funds are forfeited and the IRS when you pay taxes on money that you forfeited! Companies WILL DO ANYTHING to ensure funds are forfeited. In my case I dutifully collected receipts and then had the entire lot rejected because I did not have the SSNs for those who wrote the reciepts. By the time I was told why none of my reciepts were being honored, it was too late to get SSN’s, even if I had somehow been able to persuade people to give me their SSN’s. This was a very stressful experience and ended up being a major factor in why I quit the company. Simon, it is truly unfortunate what happened to you. However, I do have practical experience with a FSA – in fact I’ve been using it with no issues whatsoever for the past two years. Granted, it takes a few minutes to fill out the forms, but the 5 minutes of pen work is well worth it. Fortunately people can learn from your unfortunate experiences. Yes, it is a scam. Company started taking money into FSA before they enabled my account for FSA (1 month benefit delay), then I left job and the last paycheck long after I’m not with the company still withdraws a chunk of money, but I can’t submit any claims for the next month because I only had FSA for the previous month. So, CBIZ FSA will get $200 bonus (could be worse). And nobody wanted to do anything to help. S-C-A-M!!! I say, if they scam us, we need to scam them, period. Can you explain to me how you’re paying tax on the money forfeited for FSA Dependent care? On Form 2441 Line 16 for 2009, you subtract the amount you forfeited. So, e.g, if you put in $5000 for FSA Dependent care, and you have receipts for $4300, but you hand in on time only $4000 of receipts, I would think that you have forfeited 5000-4000=1000 (line 16 of 2441 Part III). Hence line 17 is 5000-1000=$4000, so I don’t see how you’ll be taxed on the $1000 that you lost. Although I read on wikipedia under FSA that if you set aside $5000 & have a non-working spouse and also fail to hand in receipts on time, you not only forfeit the $5000, but pay tax on it as well. This seems to contradict the form, but support your claim that you forfeit the money & also are taxed on what you forfeited. If you or someone else can assist me on this, I would appreciate it. In mid March 2010, we submitted our 2009 FSA claim for the $1500 we had withheld and that we spent the previous year. Mid April, I called to find out the status of our claim (to find out where our money was). The company (HFS) said that they never received the claim and since it was past the March 31 deadline, they denied our claim and subsequent appeal. Make sure that you send in your claims via certified mail. Do not use regular mail or fax your claim into the company!!!!!! They can deny receiving the claim. We faxed ours and we have a phone record showing we made the call to their machine in mid march. We don’t know what else to do but sue them and that’ll cost us more in legal fees than the $1500 they’re keeping. It’s a tough ecomony and these financial companies are doing whatever they can to keep your money. Be careful!!!!! The money does not go to the IRS, it goes to the employer so it is a Corporate scam. The scam is enabled by so called “audits”. when your account is frozen, why are your contributions not frozen also. This is a cruel corporate hoax on working people.